Busy weekdays call for dinners that are quick, easy and delicious. 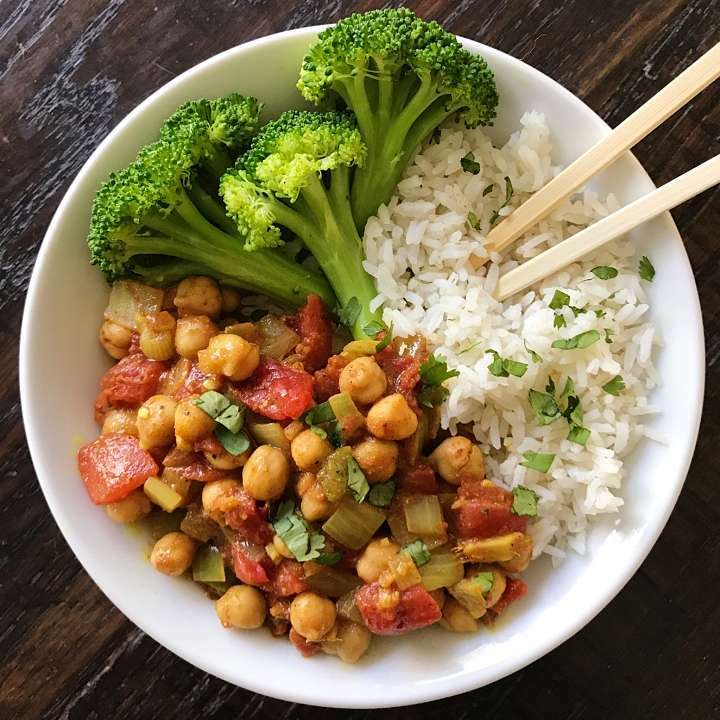 This Chana Masala is just one of those meals… Otherwise known as Savory Indian Chickpeas, this super simple dish is packed with flavor, comes together quickly and heats up well. Recipe adapted from Eating Well, this vegetarian Indian recipe it’s just canned chickpeas cooked up with onion, diced tomatoes, garlic, ginger and lots of yummy spices like cumin, coriander, turmeric and garam masala. It is paired with rice and a side of steamed broccoli which nicely balances the flavorful chickpeas. A super simple but flavorful gluten-free and plant-based meal that comes together in less than 30 minutes... perfect for busy weekdays! Recipe adapted from Eating Well.